This is an action brought by the plaintiff Sylvia B. Neumann pursuant to M.G.L. c. 240, §14A for a determination of the extent to which the zoning by-law of the Town of Lincoln affects a proposed use of a certain parcel of land containing approximately 1.9 acres located on Lincoln Road in said town. Said property is shown on Appendix 5. The plaintiff proposes to erect a single family home on said parcel. This case was tried on May 1, 1987 at which time two witnesses were called, nine exhibits were introduced into evidence, and the parties filed a stipulation of agreed facts which, along with the exhibits, is incorporated herein for purposes of any appeal. 1. The Town of Lincoln adopted its original zoning by-law on March 4, 1929. This by-law has been amended over the years, the last amendment being March 23, 1985. The 1929 by-law is Exhibit "A" to the stipulation; the 1985 by-law is Exhibit "B" to the stipulation. A single-family or two-family residential lot which complied with minimum area, frontage, width, yard or depth requirements in effect at the time such lot was legally established may be used in accordance with such requirements and need not comply with any subsequently adopted by-law or amendment which increases the area, frontage, width, yard or depth requirements applicable to such residential lot, provided that the status of such lot as a separate lot has continued since its establishment and has not been changed under any by-law of the Town. The whole area of a single parcel of land under one ownership. 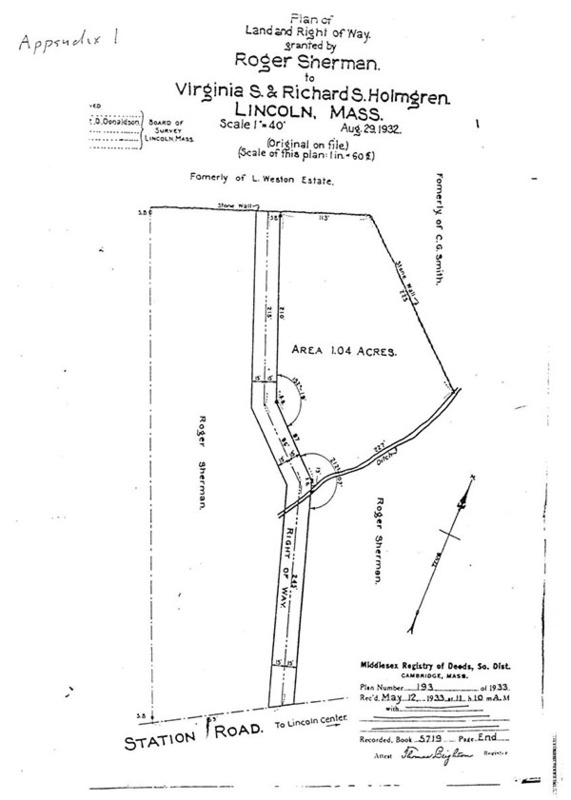 Whenever such a parcel is divided on a plan which has been recorded or filed at the Middlesex South District Registry of Deeds the term "lot" as used in this By-Law shall mean a lot as shown on such plan; or a lot shall mean a single parcel on the plot plan accompanying application for a building permit. 4. By deed recorded August 30, 1932 at Book 5665, Page 118, [Note 1] Roger Sherman conveyed 1.04 acres of land ("House Lot") in Lincoln together with a right of way to Richard S. and Virginia S. Holmgren. 5. A plan of land showing a portion of the remaining Sherman land, the House Lot conveyed to the Holmgrens and the right of way, drawn August 29, 1932 was recorded as of May 12, 1933 at Book 5719, Page End. A copy of said plan is attached hereto as Appendix 1. 6. The provisions of the 1929 by-law were applicable on May 12, 1933. 7. By deed recorded March 3, 1933 at Book 5708, Page 415, Roger and Mary Sherman conveyed a certain parcel of land to Harlan B. and Ethel A. Newton (the "Newton land"). Said parcel is incorporated on the above plan on Appendix 2 hereto. This appendix and those	following are for illustrative purposes and not necessarily to scale. 8. By deed recorded April 4, 1933 at Book 5713, Page 301, Roger Sherman conveyed another certain parcel of land to Virginia S. and Richard S. Holmgren. This parcel consisted of the remaining land as shown on the plan. The approximate extent of this conveyance is shown as Appendix 3. 9. By deed recorded November 5, 1935 at Book 5979, Page 599, the Holmgrens conveyed a parcel of land southerly of the ditch and easterly of the right of way shown on the plan to Hunter. 10. By deed recorded March 25, 1947 at Book 7115, Page 134, the Holmgrens conveyed the House Lot and right of way referred to in paragraph 4 to Ruth Lyon. 11. By deed recorded February 21, 1949 at Book 7398, Page 484, the Holmgrens conveyed what is now the Neumann property to Ruth Lyon. The property is shown on Appendix 4. When the present frontage and set back requirements were adopted in 1955, both the House Lot and the Neumann property were in common ownership in Ruth Lyon. 12. By deed recorded November 22, 1977 at Book 13360, Page 199, Ruth Lyon conveyed the above two parcels of land to J. Timothy and Margaret A. Grobleski. 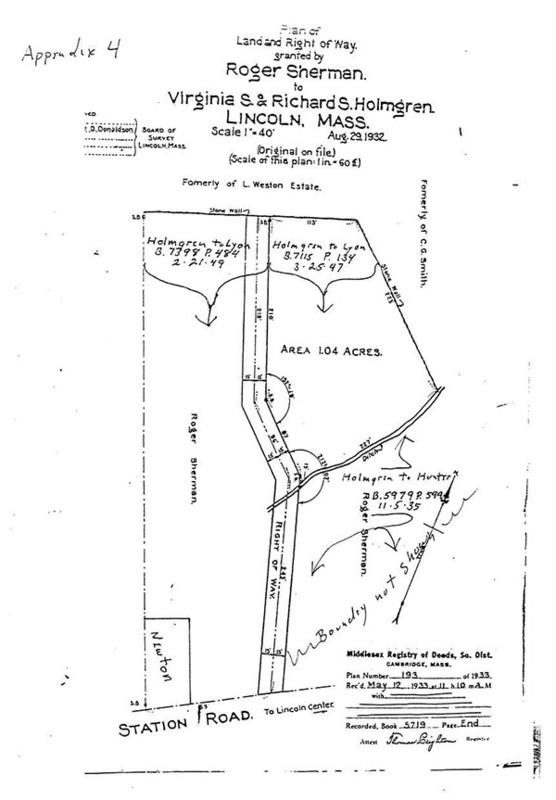 Said deed described the land conveyed in two parcels: the House Lot and the present Neumann property. 13. By deed recorded June 30, 1982 at Book 14652, Page 166, J. Timothy and Margaret A. Grobleski conveyed to the plaintiff Sylvia B. Neumann the property referred to in paragraph 10 above. This property is shown on Appendix 5. 14. The Neumann property does not conform to the minimum width and frontage requirements of the existing by-laws nor did it conform in 1982. 15. There is no evidence of any plan showing the Neumann property having been recorded with the Middlesex South Registry. While the 1933 plan includes what is now the Neumann property, it does not show this property as a separate lot. A "Lot" is shown on a plan only if all of the boundaries of the property are depicted on the plan. Charter v. Board of Appeals of Milton, 348 Mass. 237 , 244-45 (1964). It does show the land and right of way conveyed to the Holmgrens in 1932 and a portion of the remaining Sherman property. 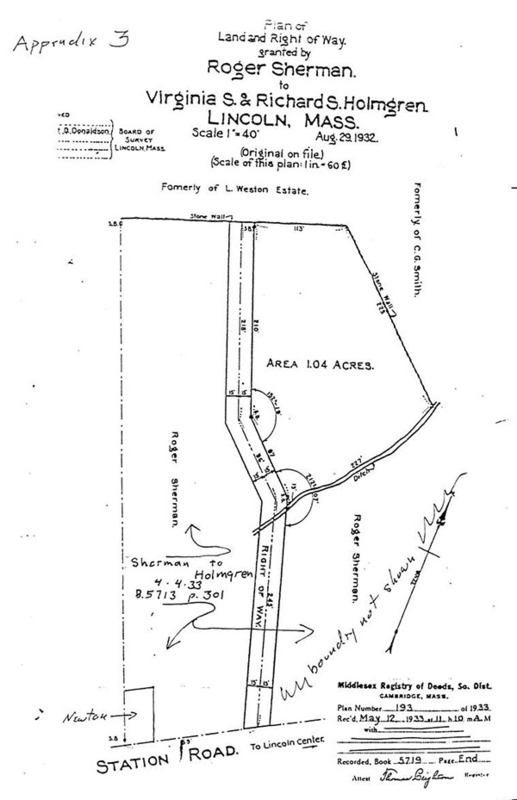 What may appear to be a boundary between the remaining easterly and westerly portion of the Sherman property is not a division but, as is clear from deeds, the base line of the right of way. 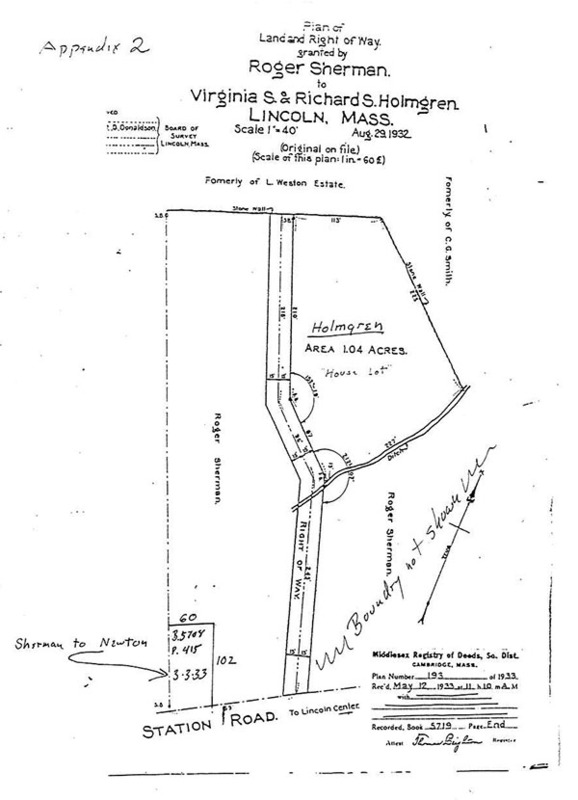 On the plan, the land retained by Sherman included what is now the Neumann property, the Newton land, and a substantial area of additional land southerly of the ditch. 16. On or about May 1957, Ruth Lyon, who from February 1949 to November 1977 owned both the House Lot and adjacent Neumann property, submitted a plot plan together with an application for a building permit for an addition to the house located on the House Lot. The plan shows both the House Lot and the Neumann property as one parcel and contains measurements demonstrating that this parcel conformed to the then applicable zoning by-law (Exhibit 3) as such parcel would conform under the present by-law. 17. The Holmgrens constructed the house on the House Lot between 1933 and 1934. The house was constructed and is still located about six feet from the right of way shown on the plan (Exhibit E). Were the House Lot the only land owned by the Holmgrens, the house would have been in violation of Sec. 14 of the then effective zoning by-law at the time of its construction. The by-law then required "a front yard of at least 25 feet in clear depth between the building and the line of the way on which the building fronts." Prior to the completion of the house, however, the Holmgrens acquired the present Neumann property which brought the house into compliance with the zoning by-law (Exhibits 8, 9, Admission Ex. 8, Stipulation Ex. A). Inasmuch as the Neumann property is not "divided on a plan which has been recorded or filed at the Middlesex South District Registry of Deeds," I next consider whether or not the Neumann property has been "established" as a separate lot and has continued so since its establishment. The Neumann property is what remained in the Holmgrens after their 1947 sale to Mrs. Lyon of the "House Lot." The purpose of this retention is unclear, as it appears to have put the House Lot at least, in zoning violation. About two years later in 1949, as set forth in paragraph 11 above, Mrs. Lyon acquired the Neumann property, again bringing the combined properties into compliance. While the 1949 deed does set out the Neumann land by description, it is apparent that this land was necessary to bring the House Lot into conformance. In any event, in 1957 Mrs. Lyon submitted a plot plan, showing both lots as a single parcel, accompanying her application for a building permit. Twenty years later, in 1977, she conveyed the property by a deed describing two parcels, but this conveyance by itself is insufficient to give rise to a presumption of intention to preserve the individual lots. Lindsay v. Board of Appeals of Milton, 326 Mass. 126 (1972). 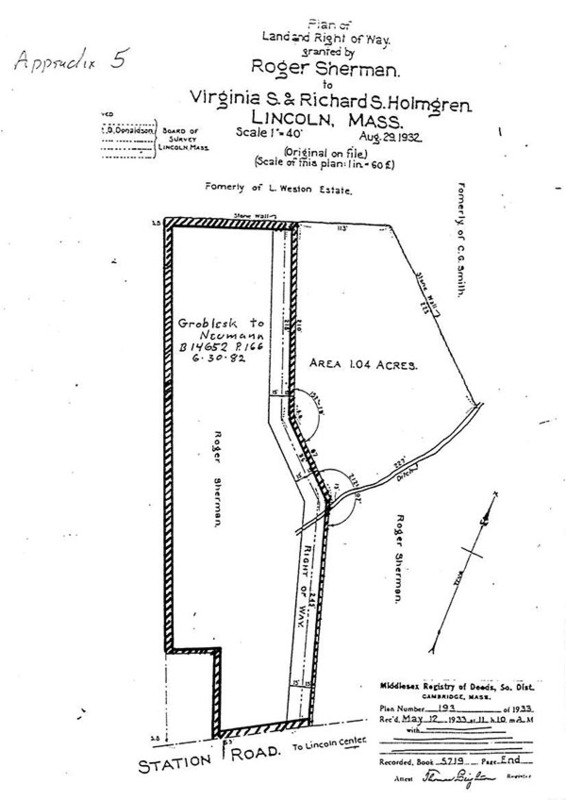 Even if the plan had delineated the Neumann property as a separate parcel, the fact that its combination with the House Lot was mandated by zoning requirements and the submission of the 1957 plan showing the entire Lyon property as one parcel clearly demonstrates that the Neumann property standing alone does not come under the protection of §4.5 of the zoning by-law. When as here landowners have treated contiguous lots as a single entity for purposes of establishing conformity with zoning laws, such lots are established as a single lot for zoning purposes. In consideration of the foregoing, I rule that the Neumann property does not come under the provisions of §4.5 of the zoning by-law and accordingly is not a buildable lot. [Note 1] All recordings referred to herein are with the Middlesex South District Registry of Deeds.